Packing for a trip is a great analogy for constructing story structure. You need to know your must-haves without which your vacation, a.k.a. the journey in the story, can’t succeed. 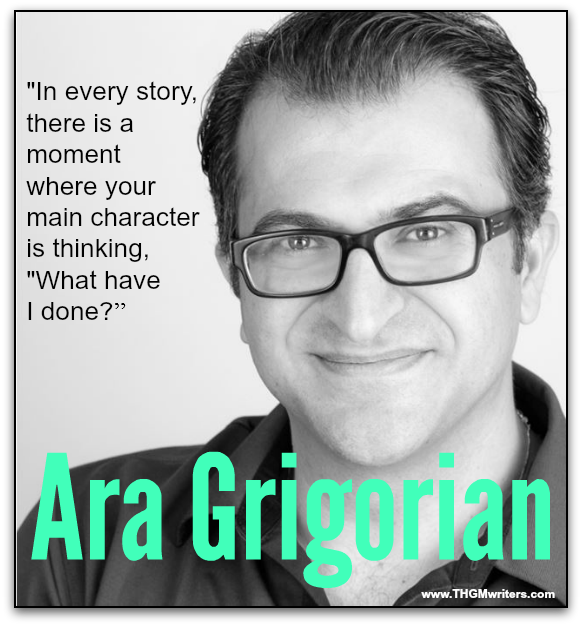 For that we turn to debut novelist Ara Grigorian, author of the New Adult romance GAME OF LOVE. (Even if romance or tennis isn’t your thing, buy the book!) Ara is a veteran of the Santa Barbara Writers’ Conference, featured prominently as a speaker on two panels (the “First Book Panel” and the “Building Your Author Platform Panel”) and as the leader of his own one-time workshop, “Finding the Story Beats”. Speaking to a packed standing-room-only audience at the Hyatt Santa Barbara on a Wednesday afternoon, Ara said, “This will not improve the quality of your writing. All those other workshops will do that. What it will do is make you a stronger storyteller.” Writers can do this by paying attention to the beats—the key moments in your story. Synthesis—the new world (SPOILER ALERT) Katniss defies the Capitol and wins the Games, sparking two more books and three more movies. 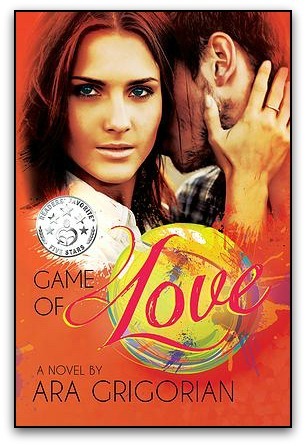 In addition to engineering, Ara also knows quite a bit about exotic travel: GAME OF LOVE takes readers from France to California to London, as its two leads, tennis superstar Gemma Lennon and scientist Andre Reyes, take their journey to love. How did Ara engineer or, to use our other metaphor, pack for this journey? And how can you do the same? To recap his entire talk would require two posts, but fortunately, Ara did it in a terrific blog post that your humble correspondent will quote in this article. Ara said, “By the time you’re done with this, you will suddenly walk away with this little disease. When you watch a movie you will say, ‘That’s a ‘Save The Cat’ scene. This applies to every kind of entertainment.” Including songs and comic books, which, by the way, Ara advised us to listen to/read because they evoke emotion by an efficiency of imagery. Definition: “Save The Cat” moment—A beat in which a character does something that shows their humanity at a cost to them. For example, Gemma, Ara’s heroine, is under pressure to leave a media mob but instead she gives tickets to a tennis match to a crying little girl who is a fan. Another example: Al Pacino in “Sea of Love”. What are the key story beats you should be thinking about? Ara’s blog post, which replicates his talk, lists nine that he has culled from great teachers—building his approach not on castles of air but on Rocks of Gibraltar. So what beats in your story are the equivalent of sunscreen, an umbrella, an extra sweater, and a great pair of walking shoes? 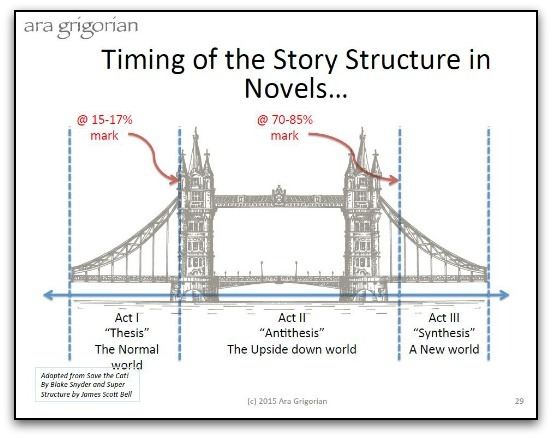 In his blog post, Ara lists nine and cites examples he gave in the workshop from “The Hunger Games” and the Julia Roberts-Hugh Grant blockbuster “Notting Hill,” a movie he watched and analyzed while plotting his own novel, which explores a similar theme: Can an ordinary person and a celebrity have a life together? N.B. :If you don’t have any of these moments in your story, it’s a bit like getting to Base Camp at Mount Everest and realizing you forgot to pack your rappelling gear. Not good. Or for the less adventure-minded, not buying sunscreen and getting a bad sunburn halfway through a vacation on Maui. 1. Opening Image/Disturbance: The opening scene needs to set the mood, style, and stakes. Workshop Moment: Actors, noted Ara, want epic roles for protagonists with major transformation. Someone asked if other characters go through major transformation. Ara said it depends on the story. For example, Harry and Sally from “When Harry Met Sally” each have to go through their own transformation. 2. Theme stated: Early in the story (certainly before the 5% mark of your story) the theme will get stated in the form of an innocent question or statement. Example: In Ara’s novel, Gemma Lennon’s tennis coach tells her that she needs to know who to trust. This innocent remark is more important than we know. No trust, no real love. 3. Catalyst/Inciting Incident/Trouble Brewing: This is where the main character’s world is thrown off balance – a life-changing moment. 4. Break into Two/First Doorway of No Return: This is a powerful scene where the protagonist makes a definitive decision to pursue the journey…Katniss makes an immediate decision – she will volunteer. Not because she thinks she can win, but because she needs to save her sister. Can Katniss change her mind? No way! 6. All is Lost/Dark Night of the Soul/Lights Out: This is a critical scene because this is where humility will bring the main character to his knees. And from this humility a new idea will rise. 7. Break into Three/Second Doorway of No Return: A solution is found. The old world, the old way of being dies and a new world emerges… Your main character’s life is on the line (the alternative is death – professional, emotional, psychological). 8. The Final Buildup and Battle: This is where you typically see the hero go up against the clock. He gathers the team, suits up for the challenge, executes the plan, only to be faced by another major challenge. 9. The Final Scene/Resonance: But we’re not done because this is the bookend scene to the opening scene. We need to see the transformation of the character. 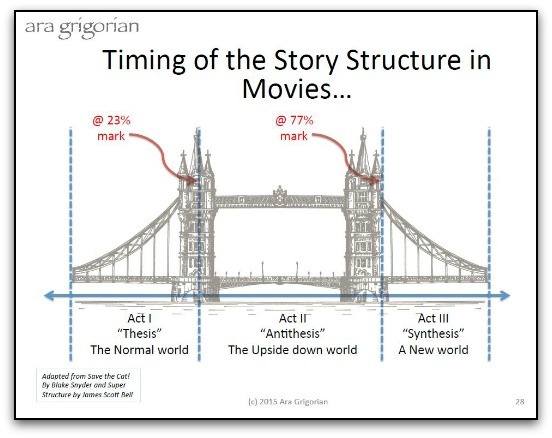 In this blog post, half of which must be credited to Ara, your humble correspondent couldn’t describe the fun of analyzing story, watching movies and the enthusiasm of the group, matched in spades by the instructor. However, if you would like more in-depth instruction, Ara does teach at the Southern California Writers’ Conference in Los Angeles. So as you’re packing for your great novelistic/screenwriting journey, ask yourself: Do I/my characters have everything needed to make this journey?